If You Can Please Make a donation – Big or Small it all helps! 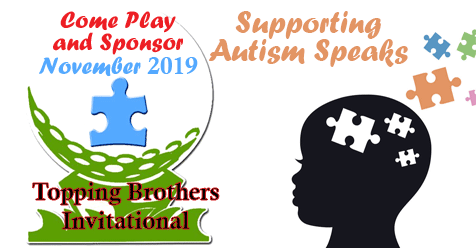 This coming November, 2019 Join us for the 9TH Annual Topping Brothers Golf Tournament at The Oaks Club Valencia. We are Raising Awareness on Autism and finding a cure is imperative. Visit AutismSpeaksSCV.com to donate now. Local to International! Autism has been deemed to be the fastest growing developmental disorder. Today, one in 68 children, and one in 42 boys, are identified as having autism spectrum disorder (ASD). According to the Centers for Disease Control and Prevention (CDC, 2017) it is the fasting-growing developmental disability in the United States. It occurs in all racial, ethnic, and social groups and is four times more likely to strike boys than girls. On April 2nd, the world joins together to “light it up blue.” Thousands of iconic landmarks and buildings join the hundreds of thousands of homes and communities around the world to “light blue” in support of people living with autism. You can put blue lights outside your home or just wear blue in support. The Topping Brothers and Autism Speaks SCV are working to raise awareness about autism and raise money to fund the fight! Stay tuned for information on our upcoming Topping Brothers Golf Tournament fundraiser event happening soon! The Topping Family work year round to help the cause!